歌舞伎町にできた新しい遊び場でのインターナショナルパーティー！ALL MIXで盛り上がる事間違いなし！DJ, LIVE, DRINK, DANCE, PARTY!!!!! Some International madness is going to be happening in one of the best tourist and international area “ Shinjuku” in Tokyo. He will be playing all different type of Muisc including Pops, Hip Hop, Dance Music, Reggaeton, Dancehall, Top40, Soca and more with his mixing skill and MC. It’s going to be a movie!!!!!!. 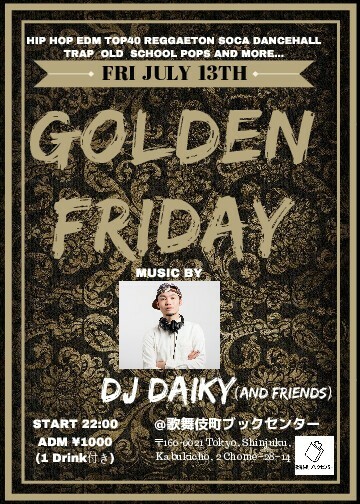 DJ DAIKY AND FRIENDS . OPEN 22:00 - 05:00 . ADM ¥1000 (With 1 DRINK TICKET).